Yes, the holidays are a time of great preparation, stress, celebration and education. Yup. I learned quite a bit. But because I am currently obsessed with The Food Network, I got it into my head to try something from their Holiday Special. I really didn't expect to be successful. 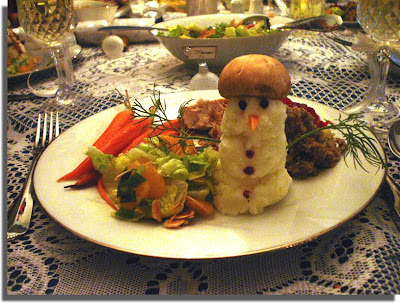 I had visions of mushy white puddles pooling on each guest's plate, with me desperately explaining "Really, they are SUPPOSED to be snowmen!" as their little carrot noses floated away under slices of turkey. But to my surprise, they did turn out! For as each family member placed their very own little snowman on their plate, I noticed no one wanted to actually EAT them. And too late I realized why. Those black peppercorn eyes peered up at us beneath jaunty mushroom caps, their green dill arms outstretched, as if pleading for their short carbohydrate lives. And neither could anyone else. Until we screwed up the courage to wipe the little faces off leaving a simple heap of potatoes once more. Except for Daughter. She was far more cruel... her little snowman got drenched with steaming dark gravy. And as I watched it slowly cascade down, I shuddered; imagining that poor little snowman bleeding turkey au jus. Lesson learned? Never put faces on your food. Especially really, really cute ones. Yep, definitely too cute to eat! I am glad my cat foods are brown and mushy. It's so unattractive, it begs to be eaten quickly so no one has to look at it any more. Those are so cute! I have to try it maybe my daughter will actually eat her food. Thank you for the great idea! Bwahaha. How beastly eating those poor snow potatos! Oh...and you are about to be removed from my blog roll!!! It’s nothing personal…I’m restarting for 2009 this Thursday. Were you at the top of the list in 2008? If not, here’s your chance to be. A single comment gets you on my blog roll. Keep commenting and you’ll stay at the top. Hope to see you in 2009! Oh~! The horror! I could not eat them either. They are too darn cute. Very creative of you. I would have no patience. Their little faces would have been smushed into a pile and the peppercorn just thrown onto the top. OMG! Those are awesome! The whole stinkin' dinner looks scrum-yum!!! I'm eating at your place next Christmas. Or maybe this New Years. Whichever comes first. Daisy: Aw thanks! And I can relate to the cat food thingy; I have three cats and luckily they inhale their wet food quickly! Jen: Aw, you're welcome! I hope your daughter has an easier time of it than us adults did! VE: I know! It was a cruel, cruel thing to do on Christmas Eve. Oh, and of course I shall be up there once again on your blogroll... at my last count, I do believe I was 15th on your long, long list this year. Kathy: Hahahaha! Cute and inedible is right! Thanks so much for the Stumble! Those are very, very cute and you were very daring to even try them, but I love mashed potatoes too much to let them go to waste. I would have been all over the little guys. Luckily you didn't poor yellow butter on them b/c everyone knows a snowman's kryptonite is yellow snow. I don't think I can top the last comment, but wanted to let you know I would eat them, no problem. Mashed potatoes, oh, yeah. The best thing about trying things like this is you are allowed to play with your food. That should appeal to everyone. I discovered your blog looking for something else and I am totally hooked! I am a Star Wars and Johnny Depp loving, Canuck ( I knew you were a Canuck before I read your profile due to the use of the term Boxing day) too! I however am not so skilled a blogger as you but I do love to read them! The above post for example has to be one of the most hilarious posts I have read in a long long time! Also I am so making those snowmen for my kiddos! I have book marked you and add you to my blog roll too. Gosh, they're just... adorable! I mean, really seriously cute. I think, though, I could get over my awe of their cuteness pretty quick because they also look yummy. I would have loved to see you sculpting these. It had to have looked like Richard Dreyfuss with the mashed potatoes in Close Encounters. Only, well, more seasonal. Aww they are soo cute! I must try to make some myself.. I'd probably end up with a potato blob though..
Yellojkt: Very daring or very stupid. Luckily, it turned out to be daring... hate to look stupid in front of the in laws. The Self-Deprechaun: EWWWWwwwww.... boy am I glad hubby didn't think of that one at the table!!!! Ettarose: Oh yeah. It felt weird to be molding those things with my fingers... especially with company over! Mr Zig: Yes, it did feel wrong. Until we took there little peppercorn eyes off! Cherie: Welcome! Ha! Another SW and Johnny Depp fan and a Canuck too! Holy crap, do I have a clone???? ;) So glad you found me... now I shall have to head over to your place too! Thanks so much for popping by and commenting! Jenn: How the heck did you know THAT WAS EXACTLY WHAT WAS GOING THRU MY MIND??? While I was making them, I resisted the urge to get out a fork. ;) Awesome that you mentioned that - I love that movie! Lady Banana: That's what I thought too... especially since I add sour cream to my mashed potatos. I thought for sure they wouldn't hold up. But they did! Next time have their faces screwed up in a frown sticking their tongues out. OR dress them up as Hitler. As the family cook, I can say that I am more than impressed with that culinary sculpture. I was just stressing out getting the turkey perfect! Happy New Year to you and your family, Maureen! I'm not so sure I could have eaten them either. Regardless of how yummy they look. Oh yes but what an attractive scrumdiddlyicious plate. Mouth watering. Mmmm... mashed taters! I would have eaten my Mr. Potato Man right away. But not before I tortured him and made him talk like Mr. Bill. Wishing you a wonderful 2009, Maureen!! What a fabulous idea! I never heard of that before. Brilliant. I will definitely show this to my Queen and I've got a funny feeling that we will be making some Christmas snowmen. Yumboza! Marvel Goose: Ha! 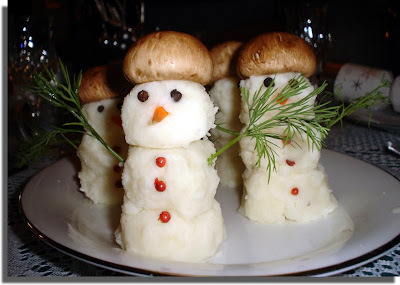 Good idea about making them not so cute... but I don't think Hitler snowmen would have gone over too well Christmas Eve... my inlaws are German! Yikes!!! Toners: Yes, kids I think are far less squeamish than adults about such things! Happy New Year to you too! Ed: But just think how much fun your kiddos would have...Happy New Year as well! Aw, thanks Janet! Har about not being able to even WEAR something with a face on it!!! Happy New Year to you too! Jodi: And right back atcha! Thanks so much. Swubird: "Yumboza!" I LOVE it! Here I am causing all these people to play with their food... I am sooo bad! All the best to you and yours in 2009 too Swu! Those are adorable! I wouldn't want to eat them either. I have a hard time eating anything with a face. Fish, duck, etc...can't do it. However, I have no problem digging into a lobster. Go figure. Yep, they're cute, but I'd still eat 'em. Slurp. Vegas Princess: Yes, I can't eat fish with the head still on. Why is it staring at me??? Kinda like the family at the Chinese food restaurant in A Christmas Story; I'd have to have the duck's head cut off before I could dig in. Jo: Har!!! Yes, you and my daughter sound the same; she had no problem devouring the poor thing. OMG!!! That's super cute and unique!!! Love their little faces. I wish I had the patience to be so creative with food.